You’ve done your research and chosen the best resume type for the job opening and your experience, skills, and achievements. But that’s just the first step in creating a professional resume that will get the hiring manager’s attention. To make your resume rise above the competition, you have more choices to make. For example, what’s the best font to use in your resume? How large (or small) should your font be? Should you use bold and italics to set off your subheads, job titles, and other features? Is a creative resume a good idea – and if so, how creative should you get? When writing a resume, the first thing to keep in mind is your audience. If you’re submitting your application online, this means creating a resume that’s easy to read for both hiring managers and applicant tracking systems (ATS). Generally speaking, it’s a bad idea to get too fancy. 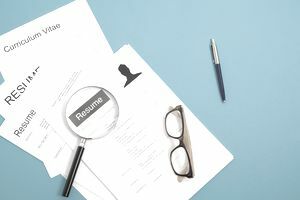 Non-standard fonts, excessive formatting, and other decorative elements won’t make it through the ATS, and could result in a garbled or unreadable CV from the perspective of the HR person on the other end. There are a few reasons why it's important to keep the formatting on your resume simple. First of all, again, many resumes are first read by applicant tracking systems, not by people. Those systems work best when reading simple text rather than fancy formatting. If an applicant tracking system can’t read your resume, the hiring manager might just throw it out. It's also important for the hiring manager to be able to easily read your resume. Basic, readable fonts like Arial, Verdana, Calibri, and Times New Roman will ensure you your resume will be read. When you are selecting a font for your resume, the font size should be between 10 and 12 to allow for readability. It can feel tempting to make the font on your resume very small, so you can include more information about each job, and still have your resume fit on one page. However, resist this urge – a tiny font is difficult to read, which will ultimately defeat your resume's purpose. Your resume should also be printed in black and white, not in color. Other colors are generally distracting for a hiring manager. You have some flexibility in your section headers. You can make these a little larger and/or bold. You should also make your name (at the top of your resume) stand at. You can make your name slightly larger, and perhaps bold, underline, or italicize it. Do be consistent in your formatting. For example, if you bold one section heading, bold them all. If you underline a company name, be sure the others are underlined as well. Also, don’t overuse capitalization, bold, italics, underlining, or other emphasizing features. Again, basic works best. Typically, you should use a readable, print font such as Times New Roman, Arial, or Calibri. However, if you are applying to a position in graphic design or advertising (where resume layout and design might be part of your assessment), employers might be open to alternative fonts, colors, and even nontraditional resumes. However, no matter what, make sure the font you choose is readable for a hiring manager. And think very carefully before using an alternative font. Make sure it is not going to hurt your chances of getting the job. If you know anyone who works at the company, consider asking them their thoughts before submitting a nontraditional resume, or a resume with a creative font or color. Read below for two ways to select a font and font size for your resume. Select a font and font size from the list at the top of your document before you start writing the resume. Either select the font from the pop-up window (right click and then select “Font”) or select the font from the list at the top of the document. Select the font size you want to use the same way. After you have selected a font and font size, it is always wise to print out and look at a copy of your resume. As you read, ask yourself: Is this resume easy to scan through? If you have to squint to read, or find that the font appears cramped, choose a different font or select a larger size for your font. If the page looks very busy and confusing – for example, if there are too many words bolded, italicized, and underlined – make the style of your resume simpler. Not sure when to bold and when to italicize – and when to leave well enough alone? Before you start work on your resume, review the sample below as well as free resume samples and templates that fit a variety of employment situations. Detail-oriented Data Entry Clerk offering 8 years’ experience performing essential data entry and receptionist functions within fast-paced, quality-critical work settings. Meticulous in processing A/P, A/R, and sales orders with 100% accuracy. Type 80 wpm with zero errors. Skilled in use Microsoft Office Suite, 10-key (by touch), multi-line phone system, and fax and copy machines. Superb work ethic and team support skills; available to work overtime and flexible shifts. Enter A/P, A/R, and sales data into proprietary computer system for a produce company, verifying accuracy of all data prior to recording. Scope of responsibility includes office reception duties, managing a multi-line phone system, and ordering supplies. Implemented a regular schedule for purging old files to make room for current ones. Recognized by management for efficiency in handling multiple tasks and requests at once. Entered and updated all data for newspaper subscribers. Answered phones and provided support to callers in confirming account details and payment schedules. Consistently earned company’s annual “Best Attitude” personnel award based on enthusiasm, cheerfulness, and willingness to help other staff with multiple projects and tasks. Maintained a perfect work attendance record, even during crippling winter weather. Received and processed payment invoices from customers, entering data into various software programs including Excel. Organized and managed files; ordered office supplies. Reduced office supply costs by 30% by researching and engaging cost-efficient new vendor. It’s easier to see what works and what doesn’t when you’re looking at a generic sample, rather than your own experience. You might also get some ideas about creative formatting that won’t make an applicant tracking system spit your resume onto the no pile.